Inviting teachers of all traditions: Uniquely, Rigpa regularly hosts teachers of all Tibetan Buddhist traditions who give teachings and empowerments, as well as Buddhist masters of other lineages, and teachers from different spiritual traditions. Such diversity is a continuation of the Rimé or ‘non-sectarian’ approach, advocated by Sogyal Rinpoche's master Jamyang Khyentse Chökyi Lodrö who was an incarnation of one of the initiators of the Rimé movement—the great 19th century master Jamyang Khyentse Wangpo. Buddhism and western science: In more recent years this open spirit of inquiry has also resulted in an active and a mutually illuminating dialogue with experts from other disciplines, both spiritual and scientific, that continues to develop Tibetan Buddhism, in particular including through Rigpa's conference programme. "Rigpa is a Tibetan word, which in general means 'intelligence' or 'awareness'. In Dzogchen, however, the highest teachings in the Buddhist tradition of Tibet, rigpa has a deeper connotation, 'the innermost nature of the mind'. The whole of the teaching of Buddha is directed towards realizing this, our ultimate nature, the state of omniscience or enlightenment–a truth so universal, so primordial that it goes beyond all limits, and beyond even religion itself." Inspired by the meaning of the word rigpa, Sogyal Rinpoche gave this as the name for the vehicle he was developing to serve the Buddha's teaching in the West. Today, Rigpa has more than 130 centres in 30 countries around the world. 1971 Sogyal Rinpoche studies comparative religion at Cambridge University, England. 1973 He helps arrange His Holiness the Dalai Lama’s first visit to the west, in Rome, Switzerland and the U.K. Meeting with Pope Paul VI. 1974 Sogyal Rinpoche begins to teach in London. 1975 Rinpoche founds his first Dharma centre, Orgyen Chö Ling in North London; Dodrupchen Rinpoche and Khenpo Thubten both give teachings. 1976 Invites Dudjom Rinpoche to London; translates for him in USA. Sogyal Rinpoche begins to teach in Paris. 1977 Orgyen Chö Ling hosts Gyalwang Karmapa; Sogyal Rinpoche publishes View, Meditation and Action. 1978 His Holiness Sakya Trizin is invited to London; Sogyal Rinpoche teaches in Ireland; Face to Face published; Dudjom Rinpoche's centre established in Paris at rue Burq under Rinpoche's guidance; first Rigpa Tibetan Calendar produced. 1979 Dzogchen Orgyen Chö Ling hosts Dudjom Rinpoche for one month in London; Sogyal Rinpoche translates for him in USA, and gives his first teaching there; Sogyal Rinpoche names his work 'Rigpa'. 1980 Dilgo Khyentse Rinpoche and Ling Rinpoche visit the Paris centre; Sogyal Rinpoche teaches in USA and in Holland; first residential retreat is held in Derbyshire, UK. 1981 Rigpa co-sponsors His Holiness the Dalai Lama's teachings on 'Training the Mind' in London. Tulku Urgyen Rinpoche invited to London; London centre moves to St Paul’s Crescent. First Easter retreat at Jouy in France, first Summer retreat at Grasse in France with Khandro Tsering Chödrön; Sogyal Rinpoche teaches in Santa Cruz, California; Serkong Rinpoche teaches at Rigpa Paris and London. 1982 Rinpoche invites Dilgo Khyentse Rinpoche to Rigpa London; invites His Holiness the Dalai Lama to give an empowerment of Padmasambhava in Paris. 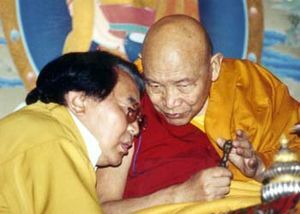 1983 Sogyal Rinpoche takes part in 'New Dimensions in Death and Dying' conference with Elisabeth Kübler-Ross and Kenneth Ring; in USA, Rigpa is established as a non-profit organization. Kalu Rinpoche teaches at Paris and London centres. 1984 His Holiness the Dalai Lama is invited to give a one day Dzogchen teaching in London; Rigpa students attend Dudjom Rinpoche's final teaching in Dordogne, France, also receiving teachings from Dilgo Khyentse Rinpoche and Nyoshul Khen Rinpoche. 1985 Sogyal Rinpoche is invited to teach in Australia and Germany; retreats in France and U.S. with Nyoshul Khenpo; Dzogchen Rinpoche invited to the West; Rinpoche teaches at Esalen and California Institute of Transpersonal Psychology. 1986 First Australian retreat; Nyoshul Khenpo invited to retreats in Wales, France and California; Rinpoche gives plenary address to U.S. National Hospice Organization; first Kirchheim retreat, Germany, winter 1986-7. 1987 Rigpa Paris established at rue Burq; Rinpoche is invited to be director of Dzogchen Beara in Ireland; Dilgo Khyentse Rinpoche visits London with Trulshik Rinpoche; summer retreat at Les Ages, with Nyoshul Khenpo, Chagdud Tulku Rinpoche, Pema Wangyal Rinpoche and Shenphen Dawa Rinpoche; Kalu Rinpoche teaches in Paris; Rigpa Germany established. 1988 Penor Rinpoche gives the transmissions of the Nyingtik Yabshyi for Rigpa London; first Thanksgiving retreat in Oakland; Dublin centre opens in Ireland. 1989 First Australian retreat at Tiona Park; Rigpa established in Holland; His Holiness Sakya Trizin teaches in Paris and at the Easter retreat, Cornwall UK; summer retreat in French Alps with Dodrupchen Rinpoche and Nyoshul Khenpo and Dzogchen Rinpoche. His Holiness the Dalai Lama is invited to give Dzogchen teachings and a Padmasambhava empowerment in San Jose; Dzogchen and Padmasambhava published. 1990 Sogyal Rinpoche gives Dzogchen teachings at the Bordeaux Easter retreat; the summer retreat is at Prapoutel in France with Dilgo Khyentse Rinpoche and many other masters; Dzongsar Khyentse Rinpoche teaches at Rigpa London; first Dzogchen Beara Christmas retreat. 1991 Rigpa Switzerland is established; the new London Centre in Caledonian Road opens; Dodrupchen Rinpoche teaches in London, Dzogchen Beara and at the summer retreat in Cassan, France, he blesses the new retreat land of Lerab Ling; His Holiness Sakya Trizin gives Vajrakilaya enpowerment in Rigpa London; Nyoshul Khenpo attends the winter retreat at Kirchheim in Germany. 1992 Dzogchen Monastery is inaugurated by His Holiness the Dalai Lama; the first three-month retreat is held at Lerab Ling; The Tibetan Book of Living and Dying is published; Dzogchen Beara trust established; courses and instructor training in Rigpa begin to be formalized. 1993 Thich Nhat Hanh and Khenpo Jikme Phuntsok invited to the Lerab Ling summer retreat; centres open in Amsterdam, Munich and Sydney; Spiritual Care programme begins. 1994 One-year retreats begin at Dzogchen Beara; Nyoshul Khenpo teaches in Paris and Lerab Ling; Rinpoche begins to teach at Salle Adyar, Paris; Dzogchen Rinpoche teaches widely; View magazine begins; Chindak Tibetan aid project is launched. Dzogchen Pönlop Rinpoche teaches at Rigpa London. 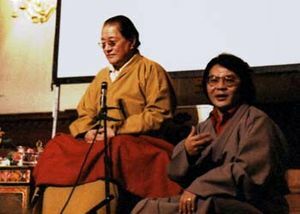 1995 His Holiness Sakya Trizin in London with Jetsun Chimey; Penor Rinpoche teaches in Paris, London and at Lerab Ling's summer retreat; Rigpa 'streams' course programme initiated in eight countries. 1996 Easter retreat at Millfield, England, with Khenchen Pema Tsewang and Dzogchen Rinpoche. His Holiness Sakya Trizin teaches in Paris and Lerab Ling. Nyoshul Khenpo and Khandro Tsering Chödrön at summer retreat at Lerab Ling, with Dzongsar Khyentse Rinpoche, Neten Chokling Rinpoche and Orgyen Tobgyal Rinpoche. Rigpa arranges Hospice conference at Germering in Germany; first Konocti Harbour retreat in U.S.A.
1997 New Sydney centre opens in Australia; Rigpa co-sponsors the Nyingma Mönlam Chenmo in Bodhgaya, organized by Dzogchen monastery; Zam audio and video founded; Dzigar Kongtrul Rinpoche tours Rigpa centres in Europe. At the Lerab Ling summer retreat there are teachings by Khenchen Pema Tsewang on Guhyagarbha Tantra, and with Neten Chokling Rinpoche and Orgyen Tobgyal Rinpoche; new San Francisco centre opens; Khenchen Pema Tsewang teaches widely in Rigpa centres. 1998 Lerab Ling invites Sherab Özer Rinpoche, Dzongsar Khyentse Rinpoche, Neten Chokling Rinpoche, Chökyi Nyima Rinpoche, Tsoknyi Rinpoche and Orgyen Tobgyal Rinpoche to the summer retreat. The winter retreat at Kirchheim, Germany, with Dzogchen Rinpoche; first 'Three Roots' retreat at Dzogchen Beara. 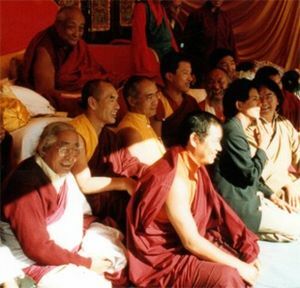 1999 New Paris centre blessed by Trulshik Rinpoche; summer retreats at Lerab Ling with Dzogchen Rinpoche, Tsoknyi Rinpoche, Chokling Rinpoche and Orgyen Tobgyal Rinpoche; Trulshik Rinpoche teaches in San Francisco, New York and Lerab Ling; new Amsterdam centre; Kirchheim Millennium retreat with Dzogchen Rinpoche, Tulku Pegyal Rinpoche and a Vajrakilaya drupchö is held. Trulshik Rinpoche teaches at Lerab Ling in November. 2000 His Holiness Sakya Trizin teaches in Paris and London centres; Trulshik Rinpoche teaches in London; summer retreat at Lerab Ling with Chokling Rinpoche; His Holiness the Dalai Lama visits Lerab Ling, and gives a major teaching entitled The Path to Enlightenment over 10 days. 2001 The Rigpa Shedra takes place for the first time, with Dzigar Kongtrul Rinpoche and Ringu Tulku Rinpoche giving an introduction to Buddhist philosophy. 2002 Lerab Ling is officially recognised as a 'religious congregation'. Dzigar Kongtrul Rinpoche, Ringu Tulku Rinpoche and Professor Steven Goodman teach at the Shedra. Mingyur Rinpoche, Neten Chokling Rinpoche, Orgyen Tobgyal Rinpoche and Tsoknyi Rinpoche visit Lerab Ling. 2003 Kyabjé Trulshik Rinpoche confers the most important transmissions from the Nyingma and Dzogchen tradition, and blesses the site of the new temple at Lerab Ling. Mingyur Rinpoche, Dzogchen Rinpoche, Chokling Rinpoche and Orgyen Tobgyal Rinpoche visit Lerab Ling. From 2003 to 2006, Khenpo Namdrol teaches the Guhyagarbha Tantra, one of the most profound and definitive teachings on the Vajrayana path. It is the first time Dodrupchen Jikme Tenpe Nyima's commentary on the Gyü Sangwa Nyingpo, requested and transcribed by Tertön Sogyal, has been taught in the West. Construction work on the temple begins in November. 2004 Orgyen Tobgyal Rinpoche performs consecration ceremonies on the site of the Lerab Ling temple. Neten Chokling Rinpoche leads a Guru Rinpoche drupchen at Lerab Ling. 2005 Kyabjé Trulshik Rinpoche visits Lerab Ling to confer the most important empowerments and transmissions associated with the Nyingma and Dzogchen teachings. 2006 Construction of the Lerab Ling temple is completed. More than 1,000 Rigpa students attend the main summer retreat. On August 9th, Rigpa's Three-year retreat begins. 2007 Building work begins on the new Spiritual Care Centre at Dzogchen Beara. Pewar Rinpoche visits Lerab Ling. His Holiness Sakya Trizin visits Lerab Ling to give teachings and an elaborate empowerment of Vajrakilaya, according to the Khön family lineage of which he is a direct descendant. Tsoknyi Rinpoche and Dzigar Kongtrul Rinpoche teach at Lerab Ling. On 4 October 2007, Sogyal Rinpoche officially opened Rigpa's new Centre in Berlin, Germany, in the presence of officials from the Mayor's office, representatives of other Buddhist groups, and 350 sangha members also attended. 2019 Rigpa's first prayer gathering in Bodhgaya, India, takes place 1-16 March. This page was last edited on 10 March 2019, at 17:41.